Two environmental groups plan to sue to stop a planned dredging project on the Willamette River in Portland, charging that federal biologists are approving dozens of detrimental projects without assessing the cumulative impact on threatened salmon and steelhead. The suit, to be filed Friday in U.S. District Court, focuses on an Army Corps of Engineers' plan to dredge 75,000 cubic yards of river bottom soil later this year from the Post Office Bar, a high spot on the Willamette about two miles from its confluence with the Columbia River. Corps' surveys indicate shoaling on the bar reaches across two-thirds of the outbound navigation channel, posing a hazard to vessels. 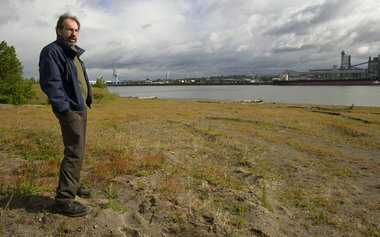 Audubon Society of Portland and Willamette Riverkeeper oppose controversial plans to dump the contaminated dredge soils on West Hayden Island, though that's not the subject of their lawsuit. Instead, the suit focuses on the Corps and on NOAA Fisheries, which evaluates river-related projects -- from dredging to boat ramp replacement to bridge building -- for effects on wild fish listed under the Endangered Species Act. The fisheries service is "rubber stamping" detrimental projects all along the Willamette, the suit says, even though the river is considered critical habitat for four runs of listed salmon and steelhead. NMFS has approved more than 30 projects since 2008, the suit charges, concluding that the harm to fish from the individual projects would be minor but not analyzing the cumulative effects. NOAA spokesman Brian Gorman declined to comment on the suit, saying the agency is reviewing it. In its biological opinion on the Post Office Bar project, the fisheries service said the dredging would cause a one-month decline in rearing and migratory conditions, but would not pose a longer-term threat to fish. The opinion didn't tally the impacts of past projects. It briefly discussed future projects, noting that the fisheries service is not aware of planned activities "that would cause greater impacts to listed species than presently occur," and that the city of Portland is working on habitat restoration projects to benefit fish.